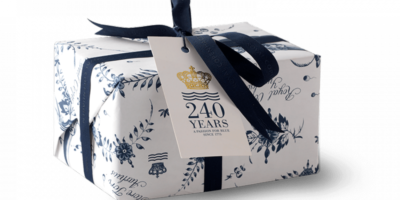 This lovely gift from Royal Copenhagen is a great example of how packaging can work as an extension of your store’s identity. For starters, the color scheme reflects the brand’s characteristic blue and white, based on the company’s signature hand-painted porcelain. The design on the paper echoes the designs that Royal Copenhagen made famous. The hang tag tells the customer or gift recipient a bit about the company’s long history — and the simple blue ribbon and bow are the perfect final touch. How can you extend your branding into your wrapping, boxes and bags? For starters, you need to establish one or more colors that are appropriate to your store. Your logo and type font are also part of the brand identity you’ll be trying to reinforce through packaging. The next step is to establish the style, and level of formality, that is appropriate to your shop. Would curling ribbon or a velvet bow be more in keeping with what you sell? Can you get away with a gift bag with tissue for gift packaging, or will your customers expect you to put each item in a high quality box? Gift packaging introduces the recipient to your store and its products. You want to make a positive first impression! Make sure your store’s name is on the package so the recipient can tell everyone where the gift they like so much is from. We use a sticker on the outside of the box, and we also line the gift box with tissue that has our logo printed subtly white-on-white. The bags that customers are given for their purchases are another great opportunity for branding. Remember, whatever shoppers carry out of your store becomes a walking billboard. And a shopping bag with an attractive graphic is likely to be reused. I’ve enjoyed seeing our bags in use for lunches, storage and travel over the years. The investment in branded store packaging can be considered part of your marketing budget — when done well, it is an effective way to promote your brand to potential new customers, and to make existing ones feel good about shopping at your store.